I had no idea what she was saying. And it wasn’t because of her English. “How old am I?” I asked. “No, how are you?” she repeated. I stopped dead in my tracks. I had no idea how to answer her; in Finland, the question “how are you?” has a rather serious connotation–you only ask if you really want to know. So truth is, I haven’t been asked it too much lately. And suddenly, I realized, I’m not used to it anymore. A big part of the Fulbright program is exchange–putting people into new cultures and having them become part of the community, part of the culture, where they live for the year. I’m not sure if “assimilation” is ever really possible, but there’s something to be said for settling into life abroad. However you function or relate to that place, you get used to it. It becomes normal. And that’s when you realize you haven’t updated your blog for three months. The tool I chose to use to keep in touch with those at home and do a little reflecting on the whole cross-cultural experience I’ve taken on doesn’t quite seem irrelevant, but somehow I never feel I have anything to write. Yes, my Finnish is still abysmal and I have daily moments of awkwardness when language hampers my best intentions. And yes, whenever I chat with someone on the bus I feel that my quietest of conversations makes me an obnoxious chatterbox. But it’s old news. 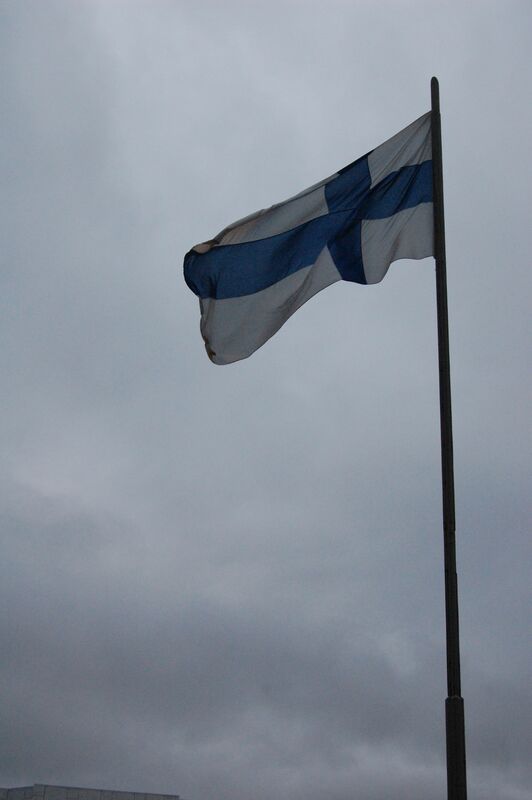 What I’ve settled into, actually, isn’t “Finnish life.” It’s really just me living in Finland. I’ve become used to being an outsider making my own normalcy out of whatever I have here. People tell me that that makes it tough to be back home after living abroad. (I.e., reverse culture shock.) I believe it. Clearly, I’m in a bit of it already–“how are you” suddenly strange to my ears. But can we avoid it? I don’t think so. And I don’t think it would be worth the time if we could. So, readers (I know there’s at least one of you), apologies for my silence here. But rest assured, it’s because I’ve found, whatever it means, a place here. This, my friends, is the final day of my 7-day blog post challenge. I have reached the end. Full admittance: I don’t know the past tense yet, so I “translated” this into the present. Also, it’s probably wrong, because Finnish is hard. Sadly, I couldn’t find a clip of Seesamtie. If only I were a child from 1997-2000…I would have learned Finnish from Evästettä Monsterin (Cookie Monster). If you were one of those people who looked at this blog over the past three days, perhaps you noticed that I did not live up to my 7-day blog post challenge attempt. I fail. Simple explanation is, I was busy and just didn’t get to it. However, despite my enjoyment of the craft of writing, the truth is that writing every day is kind of…annoying? Hard? Draining? I have a hard time coming up with topics that aren’t a waste of time. Meaningful writing includes reflection, and often that’s best when done in consideration of experiences spanning a more significant period of time. There are plenty of topics I could reflect upon and discuss here, but they wouldn’t all have to do with Finland and living here. So, they don’t make the cut. I’ll work on finding new and interesting topics. After all, exercising creativity was part of why Elle magazine horoscopes thought I should accept this challenge. But for now, I’ll stick with the parting notion that less is ever so often more. This one’s on request of Suzanne. From “Thirsty Thursday” in college to Thursday evening post-work happy hours, Americans seem to have declared Thursday the official weekday of drinking. It seems reasonable enough: just one more day in the workweek, so relax, have a drink, and stick it out for one more day until the weekend. It’s not exactly a secret that the Finns enjoy a drink or two…or many, many more. However, the “official” happy hour, when drinks are cheapest here, takes place on keskiviikko [Wednesday]. Everyone goes out, enjoys themselves…and goes back to work for two more days. Call me the ignorant American, but I don’t get it. It seems to me that with two more days of work in the week, it would be time to hit the books and get everything you haven’t finished yet done before the weekend (though perhaps this is just my workstyle). When everything is sort of set and you just need to tie up loose ends on Friday, Thursday seems like the evening you could, in good conscience, enjoy a beer at the pub. Perhaps a Wednesday happy hour is what Finns might do when Americans just congratulate themselves on “hump day,” that is, the hump of the week (everything downhill from here). They can always keep up the celebration the rest of the week. And how they do…and that, my friends, will be a story for another day.